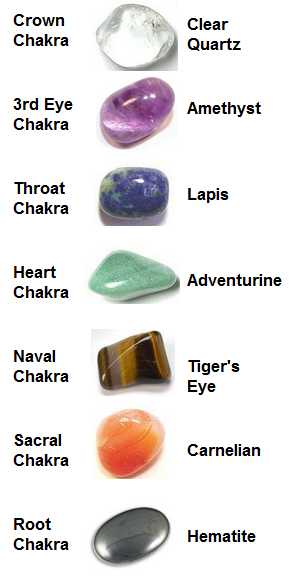 Chakra balancing with crystals. 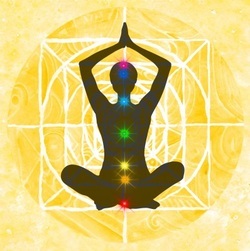 Some believe that if you balance the chakras, all your life concerns will align and begin to correct themselves. One can begin to create a myriad of manifestations. Your body consists of 7 chakras. Each chakra represents a different color and part of your body. Stones of particular colors and attributes are said to "open" the chakras, attracting more powerful positive energy to your body and spirit. The chakra bag you are purchasing will have one stone from each of the seven chakras as well as a bag to hold them and keep them with you or near you to maintain balance (7 stones). Crystals, gemstones, and talismans have been used for centuries for many things; divination, healing, beauty, good luck, meditation, energy transferance, childbirth, crossing over, awakening, increasing psychic abilities, increasing mental capacity and clarity of thought, science and technology, telekinesis, teleportation, magnetic force fields, libraries (like computer chips), agriculture, weather control, power generators, and communication. Crystals and gemstones have been used in healing rituals for centuries. It is believed that even in the ancient society of Atlantis, crystal healers were held in higher regard. It is also said that healers of Atlantis buried stones that held detailed information about the society, believing that one day the stones would be resurfaced from the earth and the energy and information could be obtained by the new civilization. Simply laying crystals around you or your house is enough to change the energy flow all around you. Some people carry stones with them to keep the energy around them positive.